Baked beans are horrible. The tinned variety, that is. They’re processed to the point of having a weird flavour and consistency. And yet, people go crazy for them. In Britain at least. It’s an unfathomable phenomenon, but one we can’t ignore. Thankfully, homemade baked beans are far nicer. It’s not the fault of the humble haricot, after all. As you can see, this recipe retains the thickness of your normal baked bean sauce, without feeling that little bit mass-produced. But there’s a little spice behind it too, with the addition of sweet smoked paprika and soy sauce. And despite the addition of sugar, it never feels too sweet with the flavour complementing the beans beautifully. You could, I suppose, add some finely chopped parsley or even coriander or chives to your beans if you wanted to take the flavour development even further. But it certainly isn’t a necessary step. Now, about the sausages. They’re entirely optional, but closer to the recommended end of the scale. 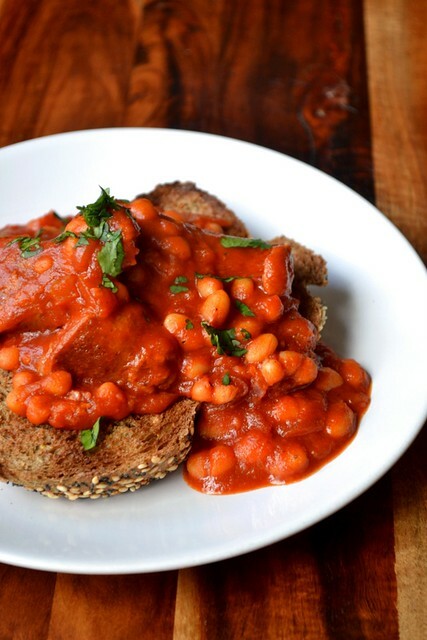 Unsurprisingly, they bring a certain richness to the baked beans and deliver an extra layer of flavour. It’s both meaty and incredibly satisfying. Besides, those tins with little processed sausages in them were everyone’s idea of a teatime treat back in 1995. For more lunch ideas, why not read my recipes for Ploughman’s Toasties, Bacon Topped Avocado on Toast and Open Stuffed Mushroom Toastie. Gently saute the diced onion and celery in the oil. Once translucent add the garlic and cook for a further 3 minutes. Start to pan fry the sausages if using. Stir through the assata, soy sauce, brown sugar and smoked paprika. Cook for 2 minutes before adding the drained beans and salt. If serving with sausages, cook until brown and slice into 1 inch slices. 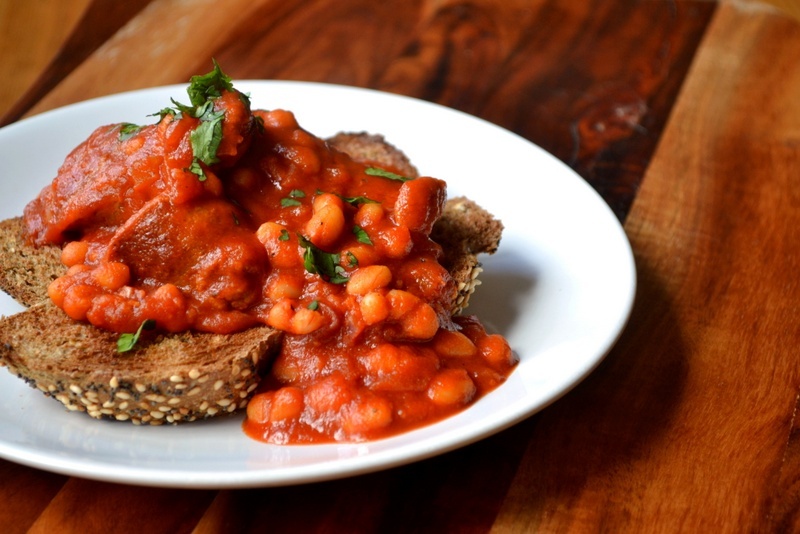 Stir the sausages through the beans and serve (on toast if you know what’s good for you). 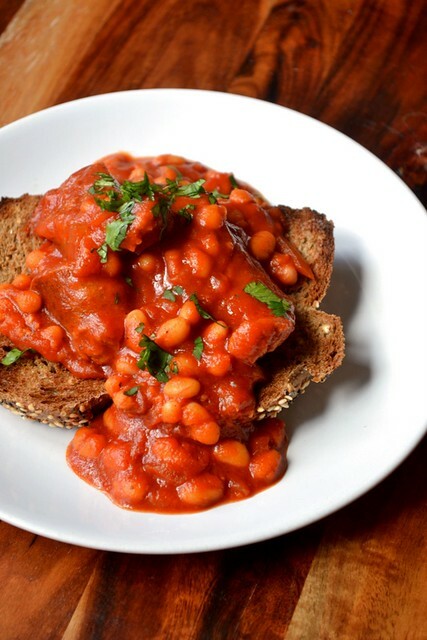 Cost: A small portion of shop-bought baked beans each for four can cost as much as £1.50. And they are disgusting. Preparing your own, albeit with sausages, may be more expensive at around £2, but your lunch will be infinitely more delicious for the expense and effort. Beautiful!. My mom never served canned beans without adding mustard, brown sugar and sauteed onions. Yum! I used to adore those gross little sausages in the beans. Your recipe sounds like heaven! I’m such a Yank, had to Google passata and haricot bean (not to mention measuring in grams). Your recipe looks so darned tasty, I can’t wait to try! Marvelous! We were just talking about beans this week. I am going to use your recipe. I like the suggested smoked paprika. Sounds devine! I recently styled baked beans for a national fast food place and you’re right, homemade is infinitely better. 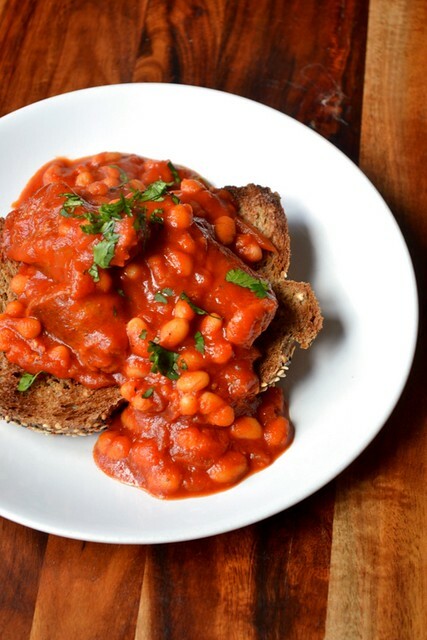 You could probably save a few pennies by using dried beans, soak overnight or even better, cook them in a slow cooker (crock pot), it will also allow the flavours to meld better. Sausages are a must, goes without saying. I so agree, Nick! Of course, here in the States most people have them as a lunch or dinner side dish rather than as the main attraction on toast or with breakfast. Looks delicious! 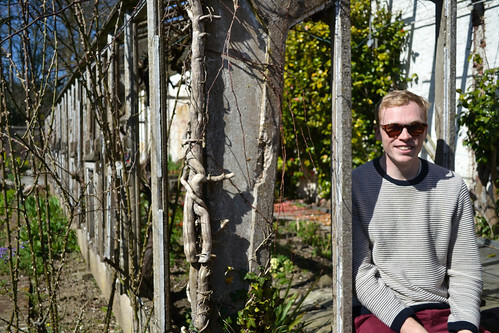 I’ve just found this blog and I cannot express how much I appreciate it!! All of the recipes are things that I’m interested in, would cook or want to cook. THANK YOU! !